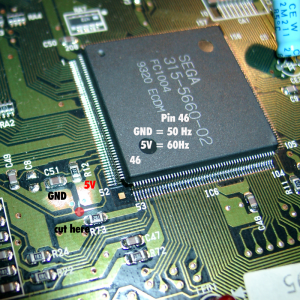 Inspired of the great site mmmonkey and sebs great code for the Sega Saturn, I will use the PIC 16F630 in a Sega Mega Drive 2 /Genesis 2. 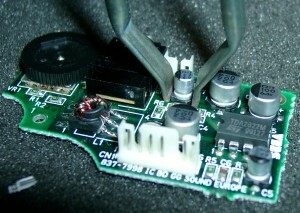 You are in need of a PIC 16F630 with sebs code, some wire, two resistors 220Ohm and a DUAL Led red/Green. 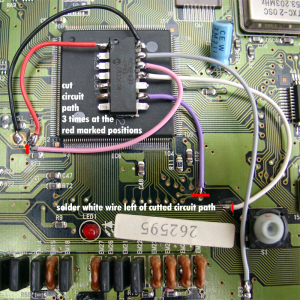 At the Mainboard you have to cut 3 circuit board tracks. 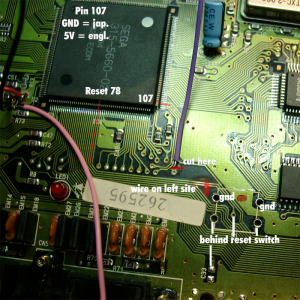 Cut the fist circuit path from pin 46 and solder the pink wire at the right site of the cut. 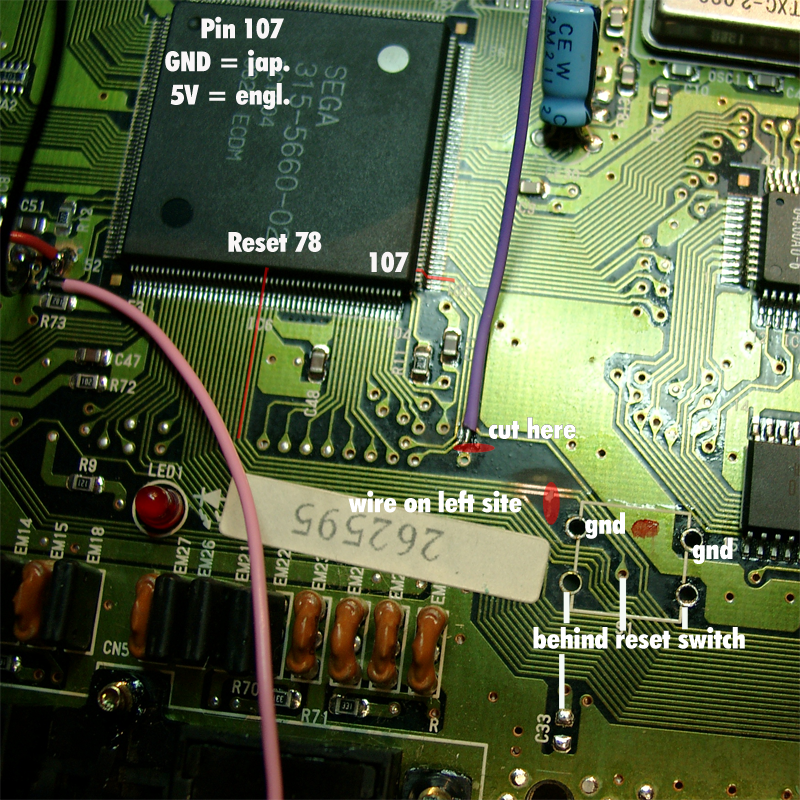 Cut the second cirquit path to Pin 107 at the marked place and solder the purple wire on the upper Side. 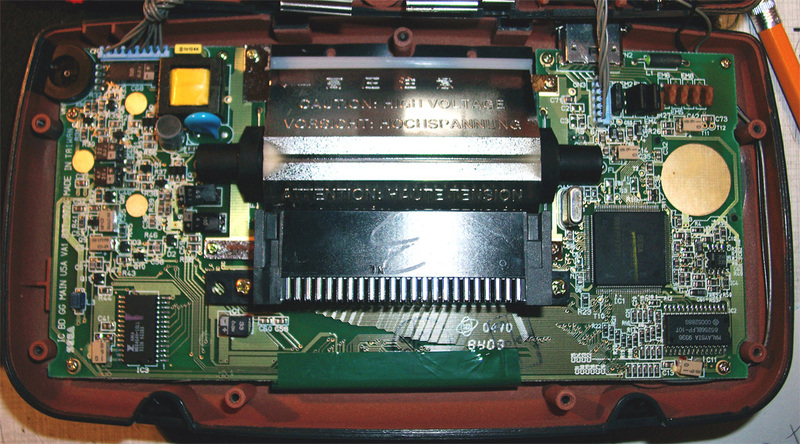 Pin 107 selecting japanese Mode (GND) or english Mode (5V). 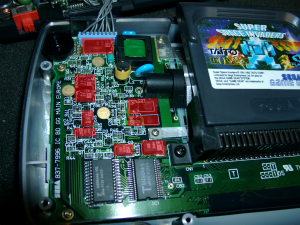 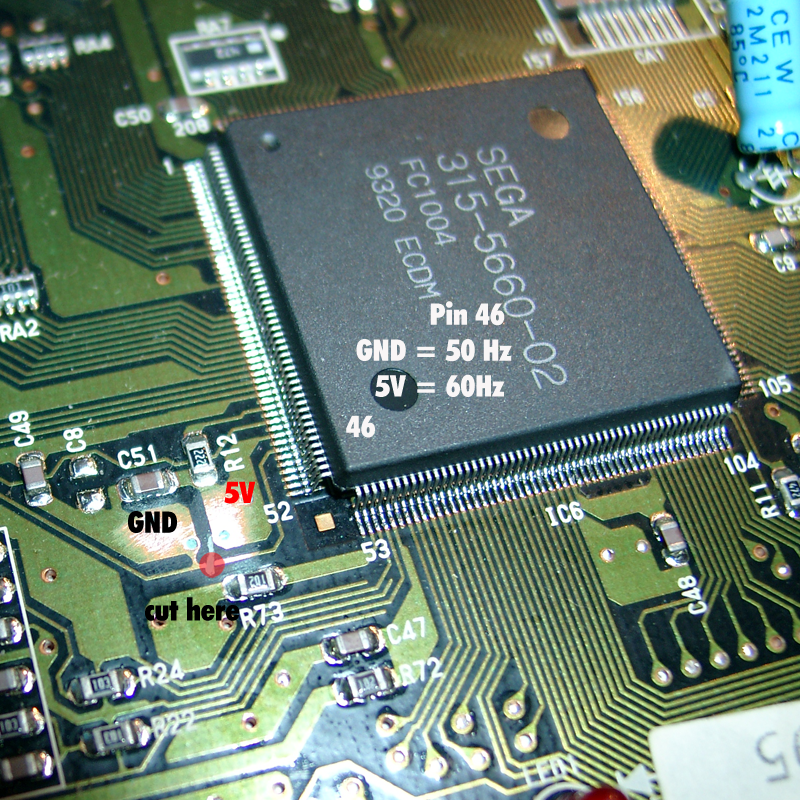 GND at Pin 78 will Reset the Sega Console. 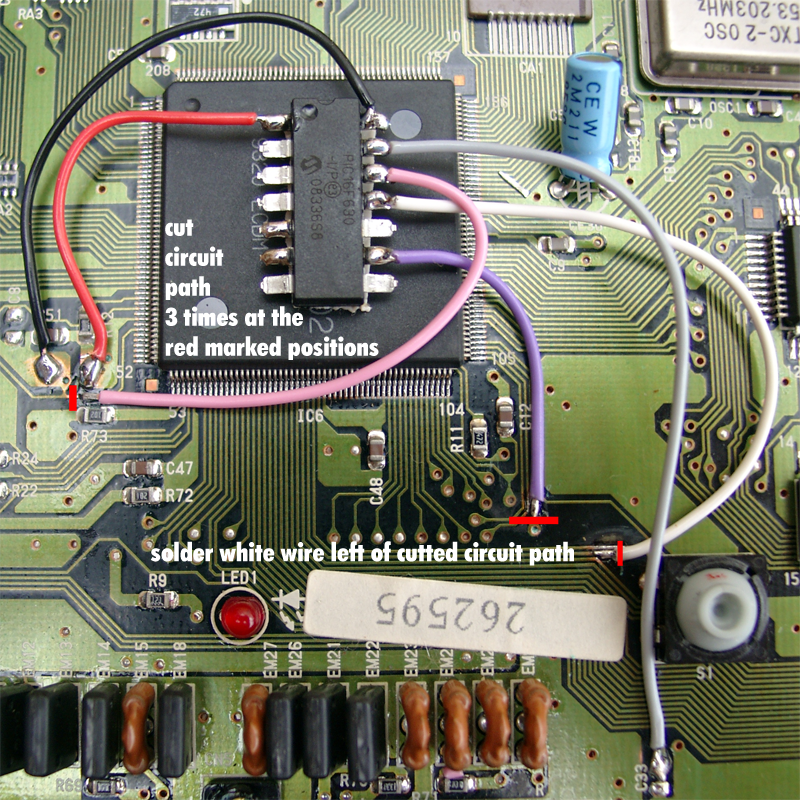 So you have to cut the 3rd cirquit path to Pin 78, see marked place and solder a white wire to the left site of the cutted path. 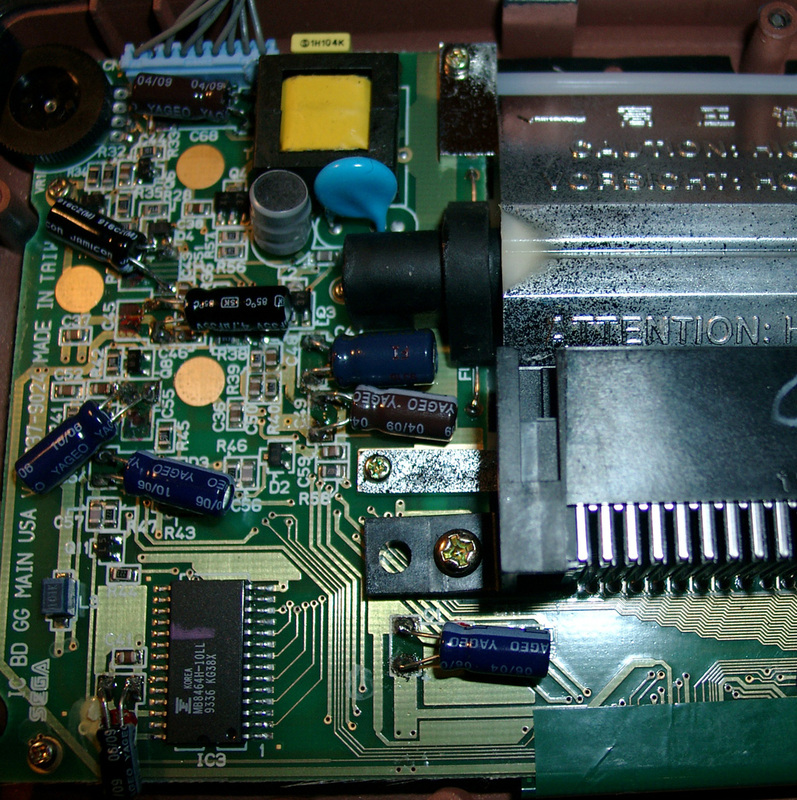 After this you have to do some mechanics. Rasp the white pvc until the 5mm LED is fitting. 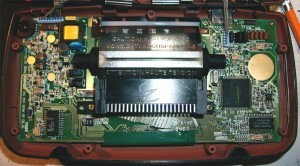 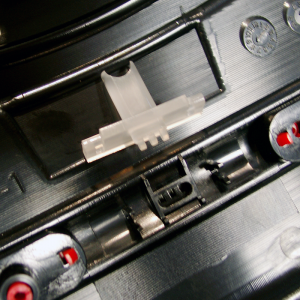 You can change the Modes via pressing the reset Button of the SMD2. 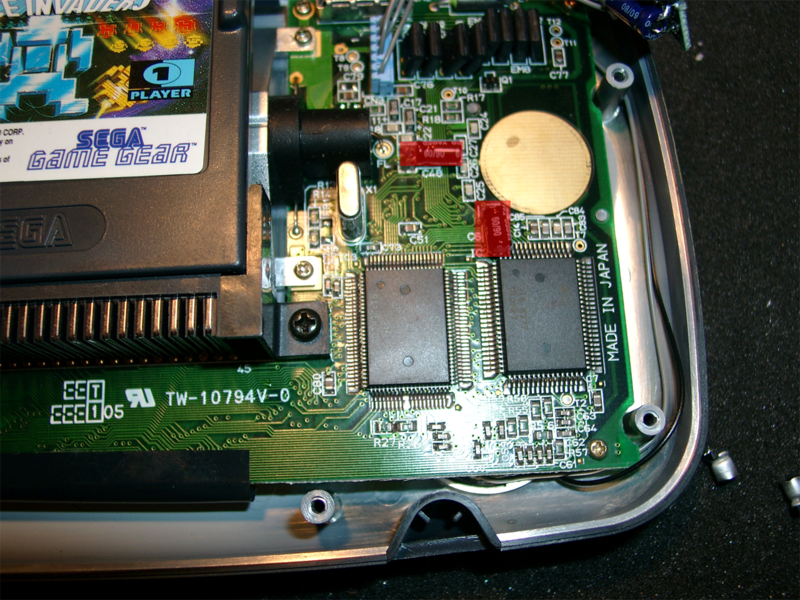 If you press the reset button around one second -> The console swaps between 50Hz and 60Hz. 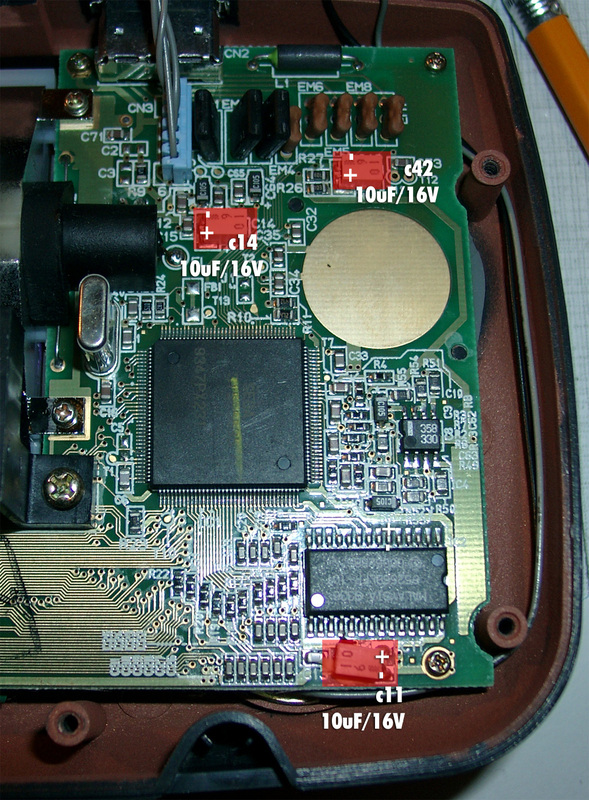 Here you can see a little video, how to use the switchless mod. 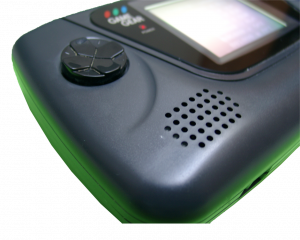 I received a GameGear without sound and the contrast of the handheld was terrible. 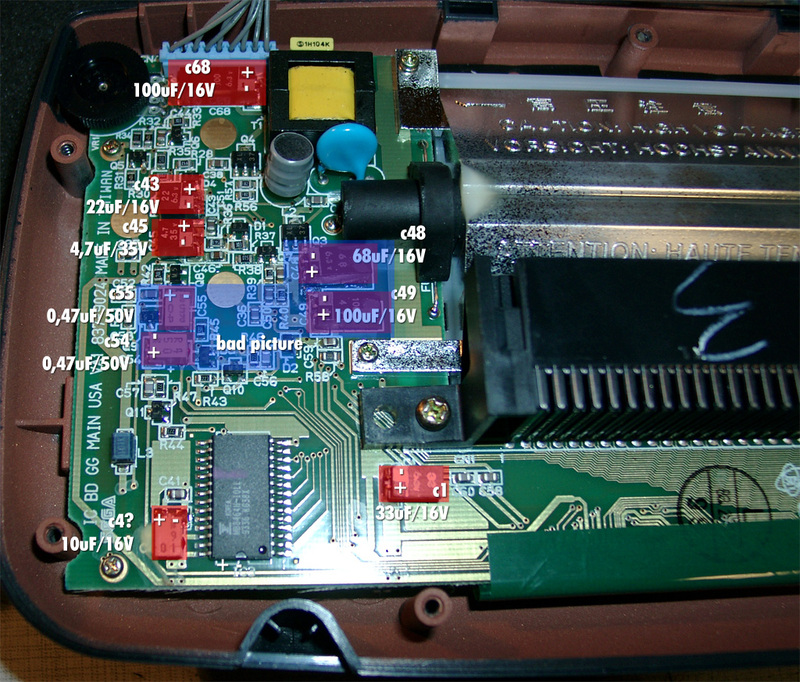 Please change 47uF 6.3V (C5) too, because if you make use of a headphone. 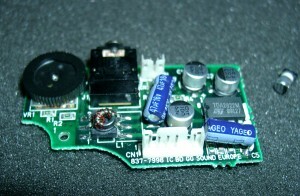 If you can’t find it with 6.3V you can make use of one with higher voltage. The display was dark, the contrast wheel didn’t help, so I changed every elko on the mainboard. 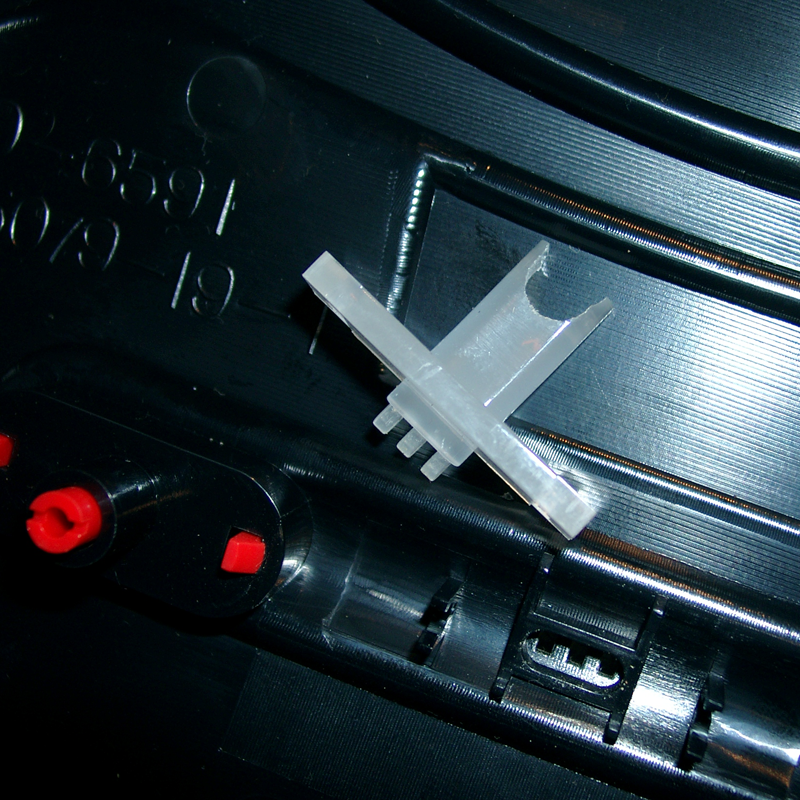 After this the picture was brighter and the contrast wheel works good again. 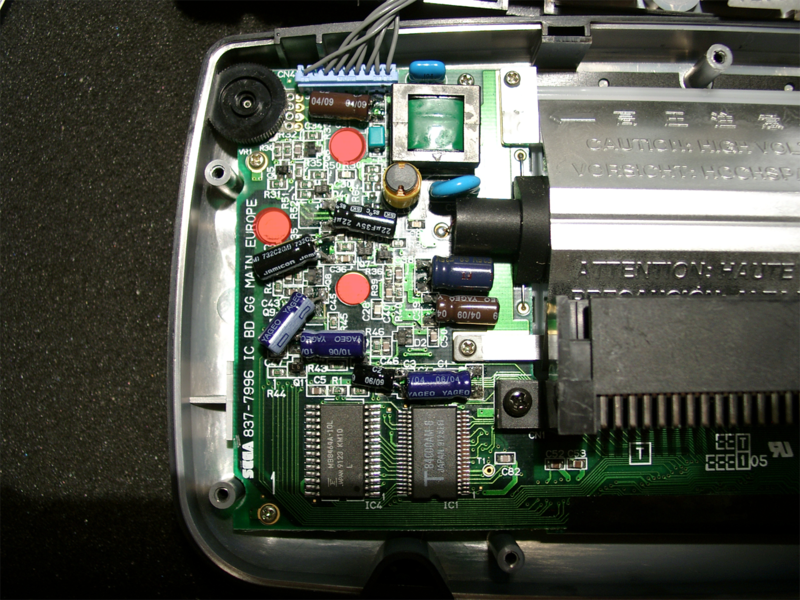 The original capacitors have some clue under it. Desolder one side of a capacitor and move it a litte bit. 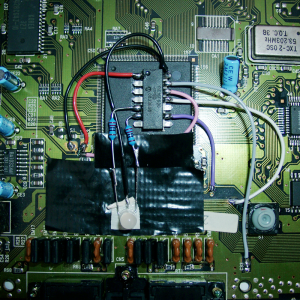 Then you can desolder the other site. 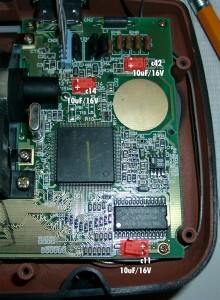 when soldering make space at the marked areas. It is needed when closing the gamegear. 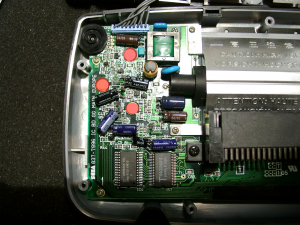 Here you can see all capacitors to be replaced. Responseable for the bac contrast are: C54,C55,C48,C49 (blue marked Area). 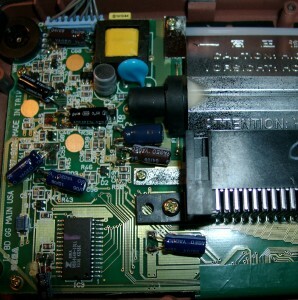 But its better to replace all to be sure.